A Clinton vs. Bush race? Again? 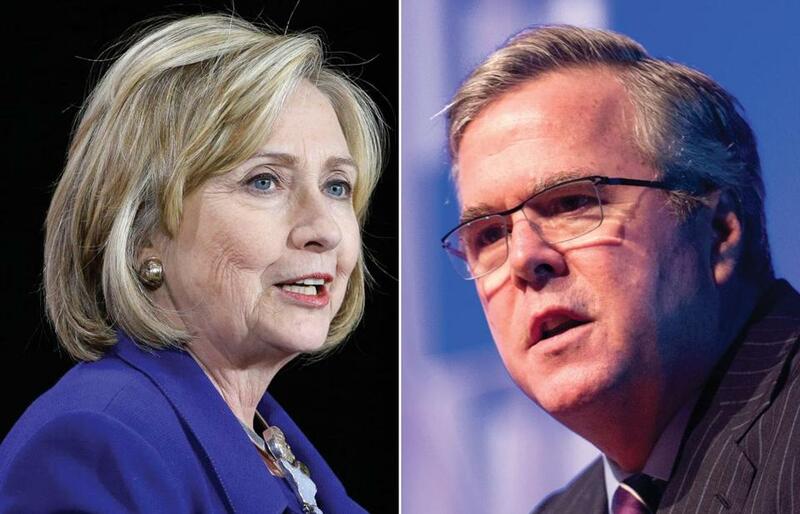 Hillary Clinton and Jeb Bush are seen as potentially formidable candidates for their parties’ respective nominations. JEB BUSH’S son, George P. Bush, told ABC News the other day that his father will “more than likely” run for the Republican presidential nomination in 2016. The former Florida governor’s other son, Jeb Bush Jr., told The New York Times that the extended Bush clan and its key allies “are getting fired up” about the prospect of a run for the White House by yet another member of the celebrated political family. In the Democratic camp, meanwhile, the “Ready for Hillary” super PAC is spending $23,000 a day, or more than $2 million per quarter, to build the infrastructure for what is expected to be a second presidential campaign by the former secretary of state. Though Clinton hasn’t declared herself a candidate, she is seen as the Democrats’ default nominee for 2016. The White House has been occupied by a Bush or Clinton for 20 of the past 26 years. A two-term Hillary Clinton or Jeb Bush administration could extend that run to 28 of the 36 years between 1989 and 2025. In every presidential election from 1980 to 2004, a Bush or Clinton was on a national ticket. Barack Obama interrupted that streak in 2008 — but only, it seems, temporarily. Americans claim they disapprove of family dynasties dominating national politics. In an April poll, 69 percent of respondents agreed that presidential contenders shouldn’t be drawn from just two or three families. But it’s easy enough to offer lip service to the anyone-can-grow-up-to-be-president egalitarian ideal that America has always liked about itself. The proof of the electoral pudding is in the voting, and the results over the past generation speak for themselves: Bush 41, Clinton 42, Bush 43. Now, as both tribes strategize about capturing No. 45, thousands of activists, fund-raisers, donors, and organizers are poised to jump on the bandwagon. A political family brand plainly counts for something, or parties wouldn’t be so eager to nominate the children or spouses or siblings of well-known politicians. A slew of candidates running for office this year are trading on their family name. Among them: Georgia gubernatorial hopeful Jason Carter, grandson of President Jimmy Carter; the aforementioned George P. Bush, running for Texas land commissioner; and Michigan’s Debbie Dingell, who hopes to take over the US House seat her husband has held since 1955. There’s no mystery about the advantages that can be conferred by such a family legacy — innumerable contacts, a pre-existing network of loyalists, high name recognition, entree into political circles, a headstart up the campaign learning curve. What does mystify — mystifies me, anyway — is why that should attract voters. I wouldn’t dream of voting for a candidate for no better reason than genealogy. The taint of nepotism and royalism would repel me. The suggestion that a candidate’s surname is a credential for high office is antidemocratic, and it ought to make no difference whether that surname is Bush or Clinton or Kennedy — or Adams. “It may be that certain families just have a sense of commitment or even a predisposition to want to be in politics,” Hillary Clinton told the German magazine Spiegel in July. Maybe so, but I’m pretty sure the craving for political power isn’t confined to elite families that can be trusted to use that power wisely. If Americans wanted to be ruled by hereditary nobles, they could have avoided a lot of trouble in 1776. Barbara Bush was right. We’ve had enough Bushes. Enough Clintons, too. Dynasty was fine as a TV series. It doesn’t belong in the White House.